Happy gloomy Saturday!! Love the overcast weather, great day to spend outside doing some yard work!!! My middle boy LOVES veggies and I mean LOVES!!! He eats tomatoes, cucumbers, and bell peppers right off the tree/vine! A few months back his class visited a local farm, where they got to pick veggies like carrots, beets, and sugar snap peas! He loved the sugar snap peas that we planted the seeds they give him and this plant is well over 4 feet tall!!! This morning we found the first peas!! Very exciting!! I've been loving playing with my embossing paste on my cards and I hope you don;t get tired of seeing them!! One this card I used white embossing paste and re-inkers to create the colored background!! Very little goes a long way, remember that if you decide to try this technique out! Colored the image with Zig Clean Brush Markers again! :) Loving them very much!! Thank you again for stopping by and I hope to see you again soon! 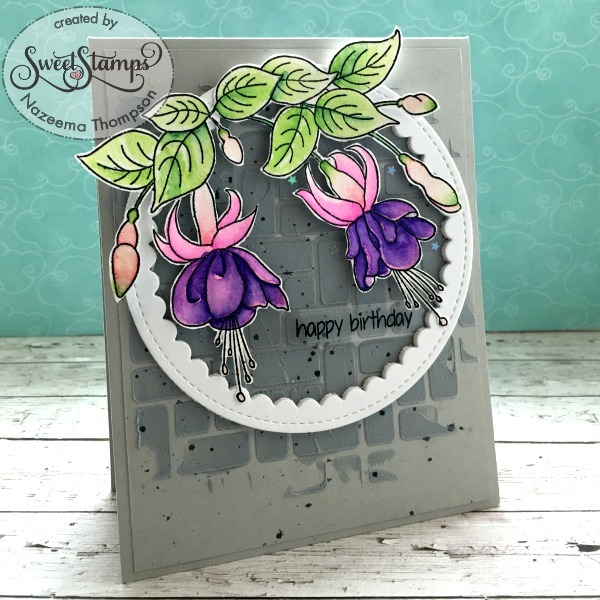 Great background and i like your arrangement of the Fuchsia on the circle die cut. Fabulous card ! It's so great for kids when they can experience in their own garden. Here in Germany the planting season just starts. I have the following planted: cucumbers, tomatoes, zucchini, pumpkin and of course chillies. I also have gooseberries, currants, apples, strawberries. But until we can harvest, it will take. WOW! This is just gorgeous! The flowers really POP! Thanks so much for joining us at The Sisterhood’s ‘NO DESIGNER PAPER’ challenge and please come back again soon! Oh this is so beautiful! Wow! Love the background very much and the flowers look gorgaous! Stunning! Thank you very much for sharing this beauty with us at FFFC. Good luck and hope to see you again really soon!